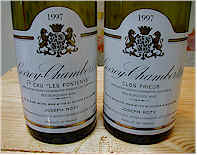 The 1997 vintage in Burgundy was warm, long and unusual. We were in Burgundy at the end of September/early October and growers were delighted with the "California Sunshine" we'd brought! The crop level was small due to uneven flowering. The night-time, harvest season temperatures were warm, reducing acidity in the fruit. As a result, many winemakers acidified their musts (juice). The vintage then, despite the sunny weather, produced a wide range of qualities. This turned out to be a stern test for many winemakers. In our tasting of Gevrey-Chambertins, featuring "simple" Gevrey-Chambertin appellation wines to premier cru level wines we found some good wines, but , in my view, no "Hall of Fame" candidates. 8th Place: DROUHIN-LAROZE 1er Cru "LAVAUX-SAINT-JACQUES"
Several tasters liked it! There were smoky, cherry-like elements but not much substance; a clean, pleasant, light-weight Burgundy. Others pointed out a short finish and a disturbing oxidized note Bob and others called attention to its light (with brick edge) color. Bob found identifiable Gevrey-Chambertin character, lean and smoky Pinot fruit, sweet spice with traces of herb and rock candy. It had nice cherry fruit but verged on simple with only moderate concentration. Gerald described this as "mildly Burgundian and certainly showing 'Pinot Noir' cherry notes...quite correct...light, watery, sharp, thin and nothing special. It may develop a bit more interest with time in the bottle, but who cares?" 7th Place: JOSEPH ROTY "CLOS PRIEUR"
Gerald pegged this as having "burnt, rubbery notes, similar to rubber or plastics in electronic equipment that's burnt...the burnt, excessively hickory-smoked notes are present on the palate, reminiscent of artificial 'smoke flavoring.' This is truly a weird wine. Bizarre." 6th Place GEORGES ET FILS LIGNIER 1er Cru "LES COMBOTTES"
Tasters found sweet prune, cherries and smoky bacon on the nose and green acid, stemmy and astringent on the palate. Another found it hot and lightweight. Another participant felt it "opened nicely with aeration." "Pickle barrel" was the character cited by someone else, who asked if this was a bit volatile. Gerald found "...hints of cherry fruit with sweet vanillin and some root-like notes...Fairly compact and a bit tight, leaning in the right direction but it lacks some 'stuffing.' Five to ten years might soften it." "COEUR de ROY VIEILLES VIGNES"
Gerald found it to show "...lots of vanilla bean notes and berry-like fruit with a high-toned fruit character...some orange peel fragrances, too...the texture is quite silky and with its mildly tannic exterior, this is a serious bottle of wine. Five to ten years aging is about right." Gerald noted "...hints of vanillin and berry fragrances...quite Burgundian and pleasant if not profound. A bit sharp on the palate, but a good attempt...this might evolve into something rather nice with five to eight years of cellaring." 3rd Place: GEANTET-PANSIOT 1er Cru "LE POISSENOT"
Several tasters liked this one. Intense, smoky, spicy if a bit hot, cedar and leather and nice long finish. But another taster disliked a  green funky silage element, which eventually blew off, but the wine remained warm and disappointing. Someone else felt this had some decaying or rotting notes. One taster pegged this as having "olive...nice, sweet olive flavors." Another found bitter tannins. Gerald's notes described this as showing "...spicy notes with a touch of a resiney character...woodsy...on the palate it has a nice berry and root-like character...interesting and curious. Five to 10 years of cellaring are possible." 2nd Place: JOSEPH ROTY 1er Cru "LES FONTENYS"
Extremely well liked by the group, this was a Burgundian Classic with sweet cherry and plum, cloves, smoked bacon, smoked salmon, balanced and long and nicely integrated oak. Another described it as bolder, more full-bodied than others in the set. One taster found it quite similar to the other Joseph Roty bottling, "...but with a more medicinal quality." Gerald said "Nice sweet vanillin notes to this mildly oaky Pinot...a bit of smoky, bacony notes...very Burgundian in style. There's enough Pinot fruit to balance the smoky elements...Hard to believe Roty made this wine and the stinkin' 'Clos Prieur' bottling." 1st Place: DENIS MORTET "EN CHAMPS" "VIEILLE VIGNE"
Always a favorite with the tasters, enthusiastic comments ran opulent, great fruit! and balanced, harmonious, savory, with a nice balance of fruit and oak. Others found it New-Worldish and far too big, monolithic and without a trace of subtlety. Another found extract for extracts sake and still another lacking structure and untypical of Gevrey- Chambertin. Some commented that the winemaker was "...trying to make a Cabernet." Bob found lots of Gevrey-Chambertin terroir with ripe Pinot fruit showing black cherry, plum and spice. Its a big, authoritative wine with that voluptuous thing. It has balance and depth and should develop and hold well for several years (or days in my wine-rack!). Gerald writes this "...has burnt wood and singed/scorched notes with smoky, toasty elements...fairly astringent and tannic with some depth. Might go for 5-10-15 years."